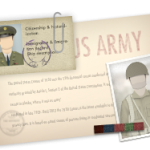 Military personnel records, separation documents and medical records are all available online. The Servicemembers Civil Relief Act Centralized Verification Service (SCRACVS) verifies if a person is, or is not, on active military duty as of a specific date. Although we do not provide historical record, many are available from the National Archives. This information can be obtained at the EVetsRecs system. However, you can also mail in a request, using form 180. If you are not the veteran or a family member, some information is still available to you at the National Archives of St. Louis. But there is a big difference between the archived records and nonarchival federal military records. Records are transferred to the Archives 62 years after the termination of military duty. For example, on Dec. 8, 2016, you could find archived records if the person left active service on or before Dec. 8, 1954. However, more recent records are in the Federal Records Center, subject to access restrictions. A good article on this difference between archived records and regular personnel records is found on the archives website. Are you looking to find where a servicemember is stationed? If so, you can start by referring to this article. There is also an excellent guide to geneological research which includes military personnel records on the archives site.